Discount available! Recommend Arduino/Raspberry Pi bridge to your friends and get your Discount. 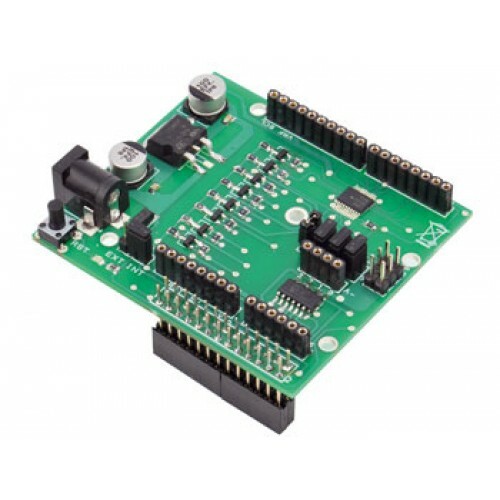 Designed to be used in combination with with Raspberry Pi (not included), this shield allows you to expand the functionality of GPIO and adds a four-channel differential or single ADC, convert levels from 3.3V to 5V (and vice versa) for the I/O, the I2C bus and the SPI, both to meet the electrical requirements of the Raspberry Pi and external devices. It also allows you to use many of the available shield for Arduino. It has 26-pin connector for connection to the GPIO connector of Raspberry Pi, jumper (EXT and INT) to select whether receive the 5V supply from pin 2 of the GPIO connector or from external controller through an 7805 IC. In this way it is possible to avoid an external power supply, when it is not necessary. The pin 2 of Raspberry Pi is capable of delivering 500 mA in rev. 1 and 300 mA in rev. 2. You must use an external power supply with shields or sensors with higher current. The analog inputs should not be a voltage higher than 2V.